If node -v doesn't work, but nodejs -v does, then something's not set up quite right on your system. See this other question for ways to fix it. Just typing node version will cause node.js to attempt loading a module named version, which doesn't exist unless you like working with confusing module names. find the installed node version. where The process object is a global that provides information about, and control over, the current Node.js process. If u have node.exe then in node you can give. One cool tip if you are using the Atom editor. It will return you not only the node version but also few other things. 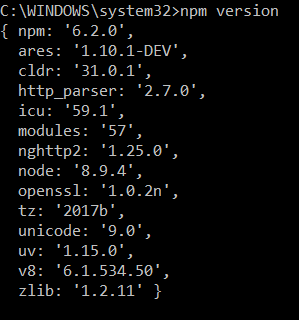 Just type npm version in your command line and it will display all the version details about node, npm, v8 engine etc. Not the answer you're looking for? Browse other questions tagged node.js command-line or ask your own question. How to check and change the Nodejs version on Ubuntu? How to get version of node from docker container? How do I get the path to the current script with Node.js?